The Mercedes-Benz A-Class F-Cell, powered by fuel cell technology, will be on display in London from 3-6 October, as part of the Grove Fuel Cell Symposium. It is the first time that DaimlerChrysler has shown the latest achievements in fuel cell technology in the UK. The car will form part of a future technology display in Trafalgar Square on Monday 3 October, alongside other exhibits. On the following three days it will offer guests and delegates to the symposium (at the Queen Elizabeth II Centre, Westminster) a chance to experience fuel cells first hand, with passenger rides around central London. DaimlerChrysler currently has the world’s largest fleet of fuel cell vehicles in everyday use around the world – 100 - all of which meet zero-emission requirements. No other motor manufacturer has as many vehicles with fuel cell drive in operation. Since 2003, 30 Mercedes fuel cell buses have been operating in the public transport systems of 10 European cities. Almost one million kilometres have been driven in over 80,000 hours of operation, and more than two million passengers have been transported. Three buses have been in use in London since January 2004, one of which is also on display as part of the Grove Fuel Symposium. Mercedes-Benz first introduced its fuel cell vision back in 1994, with the NECAR 1. The fuel cell equipment weighed 800 kilograms, and took up the entire load space of a panel van. Now, several generations later, the fuel cell fits in to the car’s sandwich floor – leaving interior space and comfort unchanged. Fuel cell-powered powertrains are often seen as a viable future propulsion system. They run on hydrogen – the lightest chemical element and one that makes up some 90 per cent of all matter in the universe. Regeneratively-produced gaseous hydrogen – the kind used in the A-Class ‘F-Cell’ – is environmentally friendly, emits only steam and cannot produce carbon dioxide. The fuel cell gets its energy from the reaction of its fuel (hydrogen) mixing with oxygen. A highly efficient process, the only waste product generated is pure water (H2O). The main way in which a fuel cell works is thanks to its most important element – the proton exchange membrane, which separates two graphite plates. Atmospheric oxygen is provided to one side of the membrane, with electrically-charged hydrogen on the other. This hydrogen can penetrate the membrane as a proton (an atomic particle). It then undergoes a controlled chemical reaction with the oxygen (forming water). This reaction creates electrical energy that provides propulsion. Although it sounds – and indeed is – a very precise science, the engineers at Mercedes-Benz have developed a system that is robust enough to be used every day. 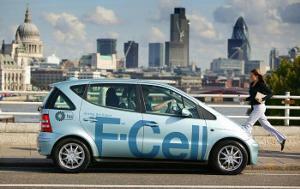 In fact, 60 customers in Germany, Japan, Singapore and the USA have been running A-Class ‘F-Cells’ since the end of 2002. The results from these practical tests are constantly being fed into the ongoing F-Cell work. Fuel consumption has been dramatically improved; and the F-Cell covered 5,190 miles in a round-the-clock endurance drive without missing a beat. The cold starting issues normally associated with the technology have been addressed, with the new vehicles able to operate in temperatures as cold as -20° C.
Wilfried Steffen, President and CEO of DaimlerChrysler UK, explained the company’s commitment to alternative power systems: "Fuel cells are widely regarded as the long-term goal for zero-emission vehicles, but DaimlerChrysler is working on a number of alternative systems that could appear much sooner. "Our engineers are working on a number of hybrid drive systems; also engines with stop and go technology; while some of our cars can run on environmentally-friendly biodiesel. Even today a customer can walk into a showroom and order a clean Mercedes-Benz diesel engine. All models meet or exceed Euro IV requirements, and deliver refined, powerful and frugal motoring." Mr Steffen concluded: "Energy for the Future isn’t just a fantasy – at DaimlerChrysler we are already a long way along the journey to delivering some of the world’s cleanest cars."